After over one year of intensive work, we are proud to announce the public Beta of Gitpod. 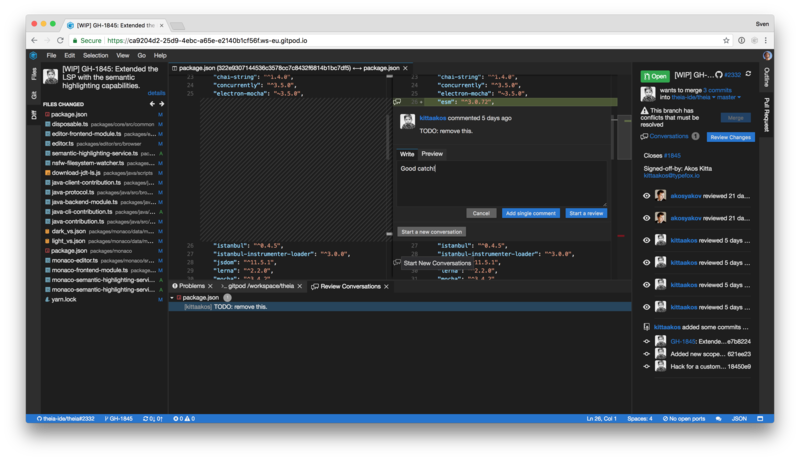 Gitpod is an online IDE which can be launched from any GitHub page. Simply prefix any GitHub-URL with “https://gitpod.io/#” or use our browser extension that adds a button to GitHub pages. 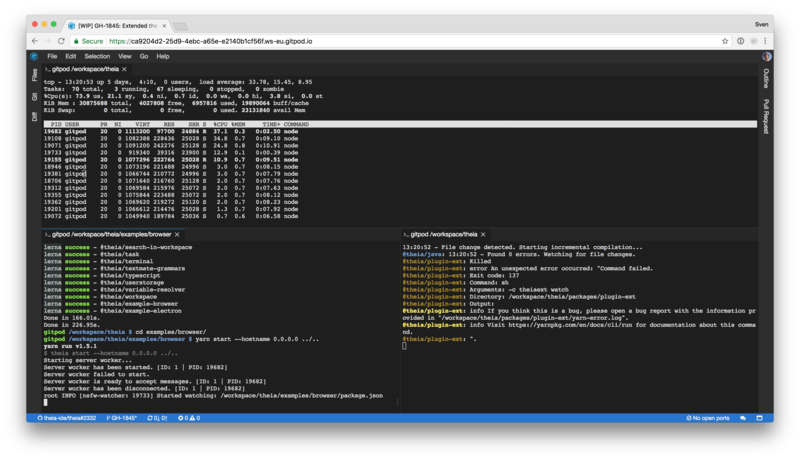 Within seconds, Gitpod provides you with a fully working development environment, including a VS Code-powered IDE and a cloud-based Linux container configured specifically for the project at hand. 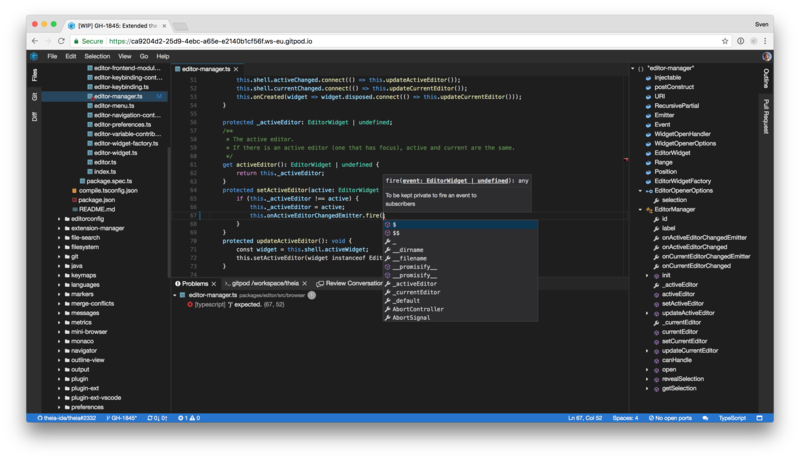 Gitpod is not another cloud IDE, aiming at replacing desktop development. Instead, Gitpod is a natural extension to GitHub. The limited editing capabilities of GitHub are far too often forcing context switches to our local machines. Gitpod extends our life on GitHub. Also, Gitpod is super simple: You don’t maintain your projects or workspaces using overwhelming and complicated dashboards. Instead, any configuration is safely stored and versioned on GitHub. If you are looking at a particular file of a certain commit on GitHub, starting a Gitpod workspace will check out the right version and open the file you’ve been looking at in the IDE. Starting a Gitpod workspace from an issue will automatically create a branch and preconfigure the commit message. Starting Gitpod from a pull request beams your right into code review mode. Once you are in the IDE, you can interact with GitHub in various ways. Besides the obvious Git integration, you can do things like commenting inline in editors, approving and even merging PRs. Gitpod is built on Kubernetes and you can use any Docker image for your development environments. This allows to fully automate the setup and frees everybody from manually going through long and outdated setup documentation. No more “works on my machine” scenarios. Gitpod provides your collaborators a single-click-to-contribute experience. More information on how to configure Gitpod can be found here. Gitpod workspaces are disposable. You simply create a fresh one whenever you need. Once you are done with your task, the IDE brings you back to GitHub, so you can continue on the next task. You usually never need to go back to any workspace, but of course you can in case you need to. Gitpod gives developers full featured terminals to run any processes such as compiling, linting or simply running tests or your application. Any docker image works and you can even configure Gitpod to automatically launch certain tasks on start. The IDE in Gitpod is based on Theia, an open-source project that we (TypeFox) have started together with our friends from Ericsson in early 2017. You can think of it as the online version of VS Code. We love VS Code, but needed some additional properties, like a more extensible architecture and the ability to run in browsers connected to a remote backend. Theia is a true open-source project, hosted at the Eclipse Foundation and developed by a diverse crowd of engineers backed by TypeFox, Ericsson, Red Hat, Arm and others. Being based on VS Code and its Language Server Protocol, Theia supports most major programming languages. The table below provides a good overview of the current state. Additional languages like C#, Swift, Clojure, Groovy, Objective-C, Markdown, Less, XML and many others are supported with syntax coloring, as well. Because it is so easy to create an extension for Theia, support will improve both in breadth (more languages) and depth, shortly. You can use Gitpod with any GitHub repository. The login is done through GitHub OAuth. At first, Gitpod will ask for accessing public repos, only. If you want to use it with a private repository, Gitpod will ask again for more permissions. Many other features are ready to use, such as Git integration or the search functionality. But also exciting new features are in development, such as debugging, collaboration **and **support for GitLab and Bitbucket. Even support for VS Code extensions is on its way. Besides more features, we are focussing on improving the overall experience by streamlining rough edges, fixing bugs and improving performance. New releases will come out continuously. If you have feedback or find bugs, please file them here.